Solar power is the generation of electricity from sunlight. This can be direct as with photovoltaics (PV), or indirect as with concentrating solar power (CSP), where the sun's energy is focused to boil water which is then used to provide power. The solar power gained from photovoltaics can be used to eliminate the need for purchased electricity (usually electricity gained from burning fossil fuels) or, if energy gained from photovoltaics exceeds the home's requirements, the extra electricity can be sold back to the home's supplier of energy, typically for credit. The largest solar power plants, like the 354 MW SEGS, are concentrating solar thermal plants, but recently multi-megawatt photovoltaic plants have been built. Completed in 2008, the 46 MW Moura photovoltaic power station in Portugal and the 40 MW Waldpolenz Solar Park in Germany are characteristic of the trend toward larger photovoltaic power stations. Much larger ones are proposed, such as the 100 MW Fort Peck Solar Farm, the 550 MW Topaz Solar Farm , and the 600 MW Rancho Cielo Solar Farm.Solar power is a predictably intermittent energy source, meaning that whilst solar power is not available at all times, we can predict with a very good degree of accuracy when it will and will not be available. Some technologies, such as solar thermal concentrators have an element of thermal storage, such as molten salts. These store spare solar energy in the form of heat which is made available overnight or during periods that solar power is not available to produce electricity. Solar power is the conversion of sunlight to electricity. Sunlight can be converted directly into electricity using photovoltaics (PV), or indirectly with concentrating solar power (CSP), which normally focuses the sun's energy to boil water which is then used to provide power, and technologies such as the Stirling engine dishes which use a Stirling cycle engine to power a generator. Photovoltaics were initially used to power small and medium-sized applications, from the calculator powered by a single solar cell to off-grid homes powered by a photovoltaic array. Solar power plants can face high installation costs, although this has been decreasing due to the learning curve. Developing countries have started to build solar power plants, replacing other sources of energy generation. Since solar radiation is intermittent, solar power generation is usually combined either with storage or other energy sources to provide continuous power, although for small distributed producer/consumers, net metering makes this transparent to the consumer. On a slightly larger scale, in Germany, a combined power plant has been demonstrated, using a mix of wind, biomass, hydro-, and solar power generation, resulting in 100% renewable energy. A legend claims that Archimedes used polished shields to concentrate sunlight on the invading Roman fleet and repel them from Syracuse . Auguste Mouchout used a parabolic trough to produce steam for the first solar steam engine in 1866. Concentrating Solar Power (CSP) systems use lenses or mirrors and tracking systems to focus a large area of sunlight into a small beam. The concentrated heat is then used as a heat source for a conventional power plant. A wide range of concentrating technologies exists; the most developed are the parabolic trough, the concentrating linear fresnel reflector, the Stirling dish and the solar power tower. Various techniques are used to track the Sun and focus light. In all of these systems a working fluid is heated by the concentrated sunlight, and is then used for power generation or energy storage. A parabolic trough consists of a linear parabolic reflector that concentrates light onto a receiver positioned along the reflector's focal line. The receiver is a tube positioned right above the middle of the parabolic mirror and is filled with a working fluid. The reflector is made to follow the Sun during the daylight hours by tracking along a single axis. Parabolic trough systems provide the best land-use factor of any solar technology. The SEGS plants in California and Acciona's Nevada Solar One near Boulder City, Nevada are representatives of this technology. The Suntrof-Mulk parabolic trough, developed by Melvin Prueitt, uses a technique inspired by Archimedes' principle to rotate the mirrors. Concentrating Linear Fresnel Reflectors are CSP-plants which use many thin mirror strips instead of parabolic mirrors to concentrate sunlight onto two tubes with working fluid. This has the advantage that flat mirrors can be used which are much cheaper than parabolic mirrors, and that more reflectors can be placed in the same amount of space, allowing more of the available sunlight to be used. Concentrating linear fresnel reflectors can be used in either large or more compact plants. A Stirling solar dish, or dish engine system, consists of a stand-alone parabolic reflector that concentrates light onto a receiver positioned at the reflector's focal point. The reflector tracks the Sun along two axes. Parabolic dish systems give the highest efficiency among CSP technologies. The 50 kW Big Dish in Canberra , Australia is an example of this technology.The Stirling solar dish combines a parabolic concentrating dishwith a Stirling heat engine which normally drives an electric generator. The advantages of Stirling solar over photovoltaic cells are higher efficiency of converting sunlight into electricity and longer lifetime.A solar power tower uses an array of tracking reflectors (heliostats) to concentrate light on a central receiver atop a tower. Power towers are more cost effective, offer higher efficiency and better energy storage capability among CSP technologies. The Solar Two in Barstow, California and the Planta Solar 10 in Sanlucar la Mayor , Spain are representatives of this technology. A solar bowl is a spherical dish mirror that is fixed in place. The receiver follows the line focus created by the dish (as opposed to a point focus with tracking parabolic mirrors). A solar cell, or photovoltaic cell (PV), is a device that converts light into electric current using the photoelectric effect. "PV Cells." Day4 Energy. N.p., n.d. Web. 14 Oct. 2009. /www.day4energy.com/glossary.htm>. This is based on the discovery by Alexandre-Edmond Becquerel who noticed that some materials release electrons when hit with rays of photons from light, which produces an electrical current.Knier, Gil, and Tony Phillips, Dr., eds. “How do Photovoltaics Work?” Science@NASA. NASA, n.d. Web. 12 Oct. 2009. /science.nasa.gov/headlines/y2002/solarcells.htm>. The first solar cell was constructed by Charles Fritts in the 1880s. Although the prototype selenium cells converted less than 1% of incident light into electricity, both Ernst Werner von Siemens and James Clerk Maxwell recognized the importance of this discovery. Following the work of Russell Ohl in the 1940s, researchers Gerald Pearson, Calvin Fuller and Daryl Chapin created the silicon solar cell in 1954. These early solar cells cost 286 USD/watt and reached efficiencies of 4.5–6%. Solar power has great potential, but in 2008 supplied less than 0.02% of the world's total energy supply. There are many competing technologies, including fourteen types of photovoltaic cells, such as thin film, monocrystalline silicon, polycrystalline silicon, and amorphous cells, as well as multiple types of concentrating solar power. It is too early to know which technology will become dominant. The earliest significant application of solar cells was as a back-up power source to the Vanguard I satellite in 1958, which allowed it to continue transmitting for over a year after its chemical battery was exhausted. The successful operation of solar cells on this mission was duplicated in many other Soviet and American satellites, and by the late 1960s, PV had become the established source of power for them. After the successful application of solar panels on the Vanguard satellite it still was not until the energy crisis, in the 1970s, that photovoltaic solar panels gained use outside of back up power suppliers on spacecraft.Knier, Gil, and Tony Phillips, Dr., eds. “How do Photovoltaics Work?” Science@NASA. NASA, n.d. Web. 12 Oct. 2009. /science.nasa.gov/headlines/y2002/solarcells.htm>. Photovoltaics went on to play an essential part in the success of early commercial satellites such as Telstar, and they remain vital to the telecommunications infrastructure today. The high cost of solar cells limited terrestrial uses throughout the 1960s. This changed in the early 1970s when prices reached levels that made PV generation competitive in remote areas without grid access. Early terrestrial uses included powering telecommunication stations, offshore oil rig, navigational buoys and railroad crossings. These off-grid applications accounted for over half of worldwide installed capacity until 2004. The 1973 oil crisis stimulated a rapid rise in the production of PV during the 1970s and early 1980s. Economies of scale which resulted from increasing production along with improvements in system performance brought the price of PV down from 100 USD/watt in 1971 to 7 USD/watt in 1985. Steadily falling oil prices during the early 1980s led to a reduction in funding for photovoltaic R&D and a discontinuation of the tax credits associated with the Energy Tax Act of 1978. These factors moderated growth to approximately 15% per year from 1984 through 1996. Since the mid-1990s, leadership in the PV sector has shifted from the US to Japan and Europe. Between 1992 and 1994 Japan increased R&D funding, established net metering guidelines, and introduced a subsidy program to encourage the installation of residential PV systems. As a result, PV installations in the country climbed from 31.2 MW in 1994 to 318 MW in 1999, and worldwide production growth increased to 30% in the late 1990s. Concentrating photovoltaics in Catalonia, Spain. Germany became the leading PV market worldwide since revising its feed-in tariff as part of the Renewable Energy Sources Act. Installed PV capacity in Germany has risen from 100 MW in 2000 to approximately 4,150 MW at the end of 2007. 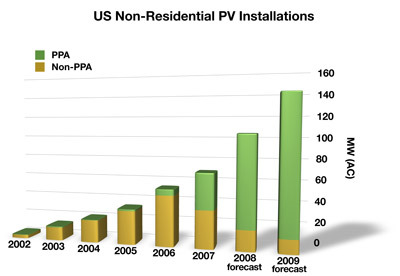 After 2007, Spain became the largest PV market after adopting a similar feed-in tariff structure in 2004, installing almost half of the photovoltaics (45%) in the world, in 2008, while France, Italy, South Korea and the U.S. have seen rapid growth recently due to various incentive programs and local market conditions. The power output of domestic photovoltaic devices is usually described in kilowatt-peak (kWp) units, as most are from 1 to 10 kW. Concentrating photovoltaics (CVP) are another new method of electricity generation from the sun. CPV systems employ sunlight concentrated onto photovoltaic surfaces for the purpose of electrical power production. Solar concentrators of all varieties may be used, which are often mounted on a solar tracker in order to keep the focal point upon the cell as the sun moves across the sky. Tracking can increase flat panel photovoltaic output by 20% in winter, and by 50% in summer. A solar updraft tower (also known as a solar chimney or solar tower) consists of a large greenhouse that funnels into a central tower. As sunlight shines on the greenhouse, the air inside is heated, and expands. The expanding air flows toward the central tower, where a turbine converts the air flow into electricity. A 50 kW prototype was constructed in Ciudad Real , Spain and operated for eight years before decommissioning in 1989. Thermoelectric, or "thermovoltaic" devices convert a temperature difference between dissimilar materials into an electric current. First proposed as a method to store solar energy by solar pioneer Mouchout in the 1800s, thermoelectrics reemerged in the Soviet Union during the 1930s. Under the direction of Soviet scientist Abram Ioffe a concentrating system was used to thermoelectrically generate power for a 1 hp engine. Thermogenerators were later used in the US space program as an energy conversion technology for powering deep space missions such as Cassini, Galileo and Viking. Research in this area is focused on raising the efficiency of these devices from 7–8% to 15–20%. Beginning with the surge in coal use which accompanied the Industrial Revolution, energy consumption has steadily transitioned from wood and biomass to fossil fuels. The early development of solar technologies starting in the 1860s was driven by an expectation that coal would soon become scarce. However development of solar technologies stagnated in the early 20th century in the face of the increasing availability, economy, and utility of coal and petroleum. The 1973 oil embargo and 1979 energy crisis caused a reorganization of energy policies around the world and brought renewed attention to developing solar technologies. Deployment strategies focused on incentive programs such as the Federal Photovoltaic Utilization Program in the US and the Sunshine Program in Japan. Other efforts included the formation of research facilities in the US (SERI, now NREL), Japan (NEDO), and Germany (Fraunhofer Institute for Solar Energy Systems ISE). Prices." Foundations for Defense of Democracies. N.p., 13 Jan. 1, 13, 2009. Web. 11 Oct. 2009. /www.defenddemocracy.org>. Photovoltaic production growth has averaged 40% per year since 2000 and installed capacity reached 10.6 GW at the end of 2007, and 14.73 GW in 2008. Since 2006 it has been economical for investors to install photovoltaics for free in return for a long term power purchase agreement. 50% of commercial systems were installed in this manner in 2007 and it is expected that 90% will by 2009. Nellis Air Force Base  is receiving photoelectric power for about 2.2 ¢/kWh and grid power for 9 ¢/kWh. Commercial concentrating solar thermal power (CSP) plants were first developed in the 1980s. CSP plants such as SEGS project in the United States have a levelized energy cost (LEC) of 12–14 ¢/kWh. The 11 MW PS10 power tower in Spain, completed in late 2005, is Europe's first commercial CSP system, and a total capacity of 300 MW is expected to be installed in the same area by 2013. Spot. N.p., 9 June 6, 9, 2009. Web. 11 Oct. 2009. Solar installations in recent years have also begun to expand into residential areas, with governments offering incentive programs to make "green" energy a more economically viable option. In Canada the RESOP (Renewable Energy Standard Offer Program), introduced in 2006, and updated in 2009 with the passage of the Green Energy Act, allows residential homeowners in Ontario with solar panel installations to sell the energy they produce back to the grid (i.e., the government) at 42¢/kWh, while drawing power from the grid at an average rate of 6¢/kWh (see feed-in tariff). The program is designed to help promote the government's green agenda and lower the strain often placed on the energy grid at peak hours. In March, 2009 the proposed FIT was increased to 80¢/kWh for small, roof-top systems (≤10 kW). The annual International Conference on Solar Photovoltaic Investments, organized by EPIA, notes that photovoltaics provides a secure, reliable return on investment, with modules typically lasting 25 to 40 years and with a payback on investment of between 8 to 12 years. Financial incentives supporting installation of solar power generation are aimed at increasing demand for solar photovoltaics such that they can become competitive with conventional methods of energy production. Another innovative way to increase demand is to harness the green purchasing power of academic institutions (universities and colleges). This has been shown to be potentially influential in catalyzing a positive spiral-effect in renewables globally. Solar energy is not available at night, making energy storage an important issue in order to provide the continuous availability of energy. Both wind powerand solar power are intermittent energy sources, meaning that all available output must be taken when it is available and either stored for whenit can be used, or transported, over transmission lines, to whereit can be used. Wind power and solar power can be complementary, in locations that experience more wind in the winter and more sun in the summer, but on days with no sun and no wind the difference needs to be made up in some manner. The Solar Twoused this method of energy storage, allowing it to store enough heat in its 68 m³storage tank to provide full output of 10 MWe for about 40 minutes, with an efficiency of about 99%.Salts are an effective storage medium because they are low-cost, have a high specific heat capacity and can deliver heat at temperatures compatible with conventional power systems, have the potential to eliminate the intermittency of solar power, by storing spare solar power in the form of heat; and using this heat overnight or during periods that solar power is not available to produce electricity. This technology has the potential to make solar power dispatchable, as the heat source can be used to generate electricity at will. Solar power installations are normally supplemented by storage or another energy source, for example with wind powerand hydropower. Off-grid PV systems have traditionally used rechargeable batteriesto store excess electricity. With grid-tied systems, excess electricity can be sent to the transmission grid. Net meteringprograms give these systems a credit for the electricity they deliver to the grid. This credit offsets electricity provided from the grid when the system cannot meet demand, effectively using the grid as a storage mechanism. Credits are normally rolled over month to month and any remaining surplus settled annually. Pumped-storage hydroelectricitystores energy in the form of water pumped when surplus electricity is available, from a lower elevation reservoir to a higher elevation one. The energy is recovered when demand is high by releasing the water: the pump becomes a turbine, and the motor a hydroelectric power generator. Combining power sources in a power plant may also address storage issues. The Institute for Solar Energy Supply Technology of the University of Kassel pilot-tested a combined power plant linking solar, wind, biogas and hydrostorage to provide load-following power around the clock, entirely from renewable sources. Joshua M. Pearce, “ Catalyzing Mass Production of Solar Photovoltaic Cells Using University Driven Green Purchasing”, International Journal of Sustainability in Higher Education, 7(4), pp. 425 – 436, 2006. Online article by scientist Jonathan G. Dorn, 22 July-2008 The solar thermal power industry experienced a surge in 2007, with 100 megawatts of new capacity worldwide.